Holy cow, I just stumbled upon this really great salad that serves as a great main dish. I just had to pass it on. It is really easy to prepare. I found this recipe in a Cooking Light magazine as I was purging some really old back issues. I was just ripping out pages that I thought looked promising, and this was one of my picks. Therefore, I can only report that it was some issue of Cooking Light, but I don’t know in what month or year it was published. Surprisingly, my whole family liked it. (There are very few dishes that I can say that about.) I hope you like it, too! 1. Cook the orzo according to package directions, not adding oil or salt. Drain, rinse with cold water. 2. Combine orzo, spinach, and the next 5 ingredients (through salt) in a large bowl. 3. Drain artichokes, reserving marinade. 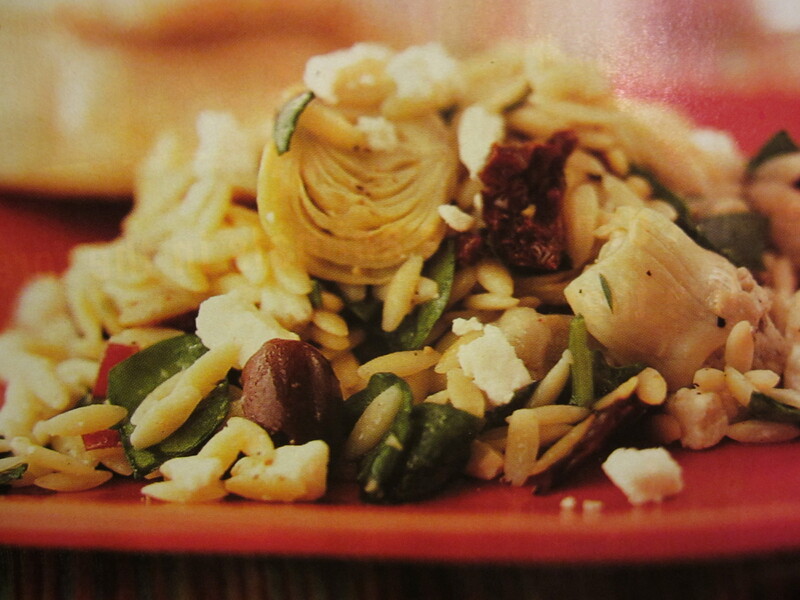 Coarsely chop artichokes and add artichokes, reserved marinade, and feta cheese to orzo mixture. Toss gently to coat. Just this week, I cooked this recipe for some dear friends. It is easy to double as well as has an easy place in the cooking process to stop/start again so that the food is hot when your guests are ready to eat. Meanwhile, heat the oil in a large skillet over medium high heat. Add the leeks, garlic salt and pepper and cook, stirring occasionally until tender, about 3- 4 min. Add the corn and wine and simmer until corn is tender, about 2-3 min. Stir in the cream. Add pasta, season with more salt/pepper and toss to combine. Fold in the spinach. Sprinkle with cheese before serving. If you don’t know exactly when your guests are arriving, switch the order. What I do is put a large pot of water on to boil and begin that process, but don’t put the pasta in yet. Prepare the sauce as stated above, but stop just before you add the cream. Take the sauce off of the heat (or reduce to very low temp) and wait for your guests’ appetites. As soon as you all are ready, throw the pasta in the boiling pot of water, put the sauce back on the heat, add the cream, (you can add some parmesan cheese to the sauce to thicken it up if it looks too runny). From that point on, continue with the recipe as written. This is a good, hearty, cold-weather soup that is easy to prepare for one of those chilly spring evenings. It serves 6 people, but can easily be doubled for a larger group. Heat oil in a large saucepan and cook garlic and onion for 5 minutes. Stir in cumin and coriander and cook for another minutes. Pour in stock and add chopped potatoes to the pan. Bring to a boil and simmer for 10 minutes. Add the chickpeas and simmer for 5 minutes more or until the potatoes and chickpeas are just tender when pierced. Blend together the cornstarch, cream, tahini, and plenty of seasoning. Stir into the soup. Add the spinach. Bring to a boil, stirring. Simmer for another 2-3 minutes. Season with cayenne pepper and salt and pepper. Entertaining non-vegetarians can be a little tricky. 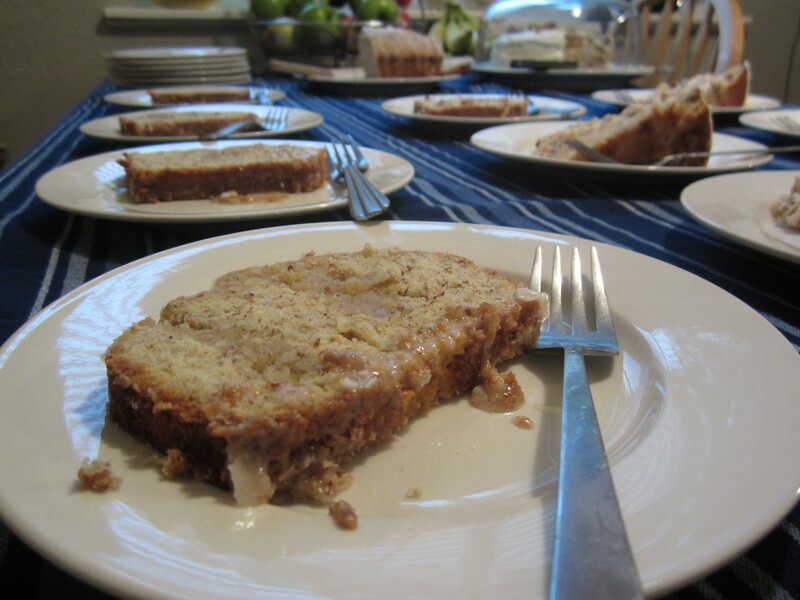 You always have to have a go-to recipe that you feel confident in serving folks in which they won’t miss the meat. Kind of an advertisement for vegetarianism – or at least not an offense to their carnivore senses. This is my go-to dish. It is really easy to prepare, can really be stalled in case the guests run late, and has flavors that distract from the absence of meat. I hope you enjoy it! Heat the oil and butter in skillet and fry shallots until soft. Add the garlic and mushrooms and fry for 6 – 7 minutes, or until the mushrooms cook down a bit. Stir in sun-dried tomatoes, wine and seasonings to taste. Stir in beans and cook for about 5-6 minutes until most of the liquid has evaporated and the beans are warmed through. Stir in Parmesan cheese. Sprinkle with parsley and serve immediately over pasta. I always use a little more wine than suggested, and this recipe is easily doubled or tripled for guests. Let me know what you think when you try it, or how you adapted it! This is another of my go-to suppers when guests are coming. The flavors are amazing, and it makes a beautiful presentation. However, it is a bit more work and requires a little planning. Preheat oven to 425. Coat baking pan with cooking spray. Heat 1 T. oil over medium-high heat. Add asparagus, bell peppers, and onion and saute 5-10 min, or until vegetables begin to soften. Add spinch, remove from heat, and stir until spinach wilts. Cool. Combine goat cheese and pesto in a bowl. Beat egg with 2 tsp. water in a separate bowl. Lay 1 sheet of puff pastry on a baking pan. Cut into 5 rectangles. Brush the edges of rectangles with egg. Scoop 2 T. of vegetables into center of each rectangle, keeping edges clear. 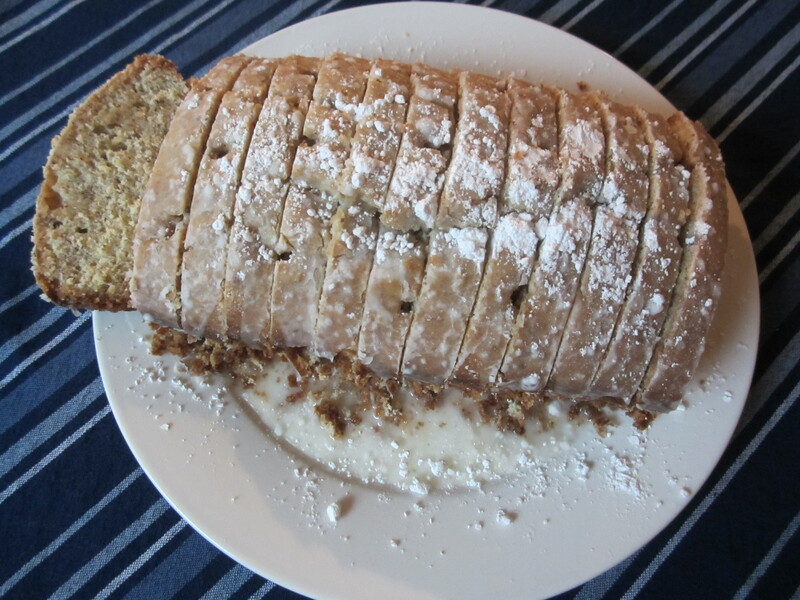 Top with pesto-cheese mixture. Cut remaining pastry sheet into 5 more rectangles, place on top of veggies, stretching gently. Press edges tightly. Brush top with egg. Chill 10 minutes. Bake 25 inutes. Meanwhile, heat tomato sauce in a pan until warm. To serve, spoon some tomato sauce onto each plate and top with the Wellington. You can substitute out asparagus for other vegetables if they’re not fresh or in season. As always, let me know what you think when you try it, and let me know what substitutions you made! In 2010, my aunt collected recipes from our family and compiled them in a cookbook. It was so well done, and was SUCH a gift to our family. I can’t imagine the hours she put in to collect all of the recipes and to organize them into a book that is lovely and represents the heart of our family. It is a collection of great food, but it is also a gathering place for sweet memories spent at Grandma’s kitchen table, a guide on how to recreate sights and smells from my childhood, and a time capsule of treasures from the past. One of the recipes that I submitted to her is one of my go-to soup recipes. I thought I’d share it with you. I hope you like it! Heat oil in a stockpot over medium heat; add onion and saute 5 – 7 minutes. Add garlic and saute 1 minute more. Add broth, bay leaf, oregano, lime zest and thyme sprigs. Bring to boil, cover, and reduce heat to low. Simmer 10 minutes. (All of the above steps are to season the broth). Strain broth, discard solids and return to stockpot. Add rice to broth. Bring to simmer over medium-low heat, cover and simmer 10 minutes. Stir in tomatoes and corn and season with salt and pepper. Simmer 10 more minutes. Simmer 10 more minutes. Place avocado and cilantro in bowls and ladle soup on top. This should feed 4 people. I always add more corn and rice – however, the arborio rice really soaks up the broth, so if you add too much, you might have to add a little vegetable broth to thin it out a bit.